Enjoy Adrienne Woods's Books? Tell us Why and Win a Free Book! 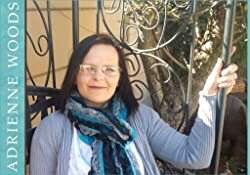 Welcome to Adrienne Woods's BookGorilla Author Page! We're working hard to bring you the best deals ever on Adrienne Woods's Kindle books. If you’re a Adrienne Woods fan, we'd love to have your help in making this author page special. Tell us, in no more than 150 words, why you think Adrienne Woods is great. Use this webform to send us your submission, and if we select yours we'll offer you one of Adrienne Woods's books or a Kindle Gift Card as a free gift! Thanks! Please enter your email address and click the Follow button to follow Adrienne Woods! This is not The Little Red Riding Hood we grew up with. Supernatural races—vampires, werewolves, witches, you name it—all exist. Eighteen-year-old Rue Chaperon and her family belong to an elite hunting society, the S.H.A—Supernatural Hunting Association—and what the Chaperons hunt best are werewolves. Sixteen-year-old Elena Watkins is on her summer break in the magical realm of Paegeia where Dragons and Magic exist. A novelette that should be read with Thunderlight, The Dragonian series part two. This is the Journal Of The Rubicon, Blake Leaf and his time at Dragonia Academy before Elena and what he felt when he met her.